Liverpool boss Jurgen Klopp has played down fears that Jordan Henderson picked up an injury during the win over Chelsea on Sunday. The Reds captain had to be replaced after 77 minutes, not before playing an instrumental role in the crucial victory over the Blues to move Liverpool back to the top of the Premier League table. Aside from the 28-year-old’s combative and all-action impact in the heart of the midfield, he has been in decisive form over the last two league games, registering a goal and two assists to keep the Merseyside giants in the hunt for the title this season. With that in mind, the last thing that Klopp needs is to see him get sidelined by an injury, but the German tactician provided an update on Henderson after the game and allayed fears. “He got a knock on his ankle, that’s pretty much all,” he said, as noted by the club’s official site. “He was fine after the game. Henderson will be needed as Liverpool return to Champions League duty in midweek as they look to complete the job against Porto to advance to the semi-finals. They’ll then face Cardiff City next Sunday hoping to potentially take advantage of Man City dropping points at home to Tottenham on Saturday, and so it promises to be a pivotal weekend in the title race. 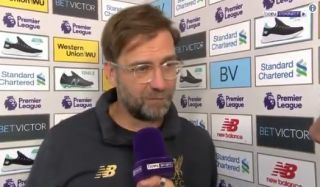 Having their influential leader available for selection will be crucial, and judging from Klopp’s comments after the game as seen above, it would seem as though Henderson will be at his disposal over the next seven days.